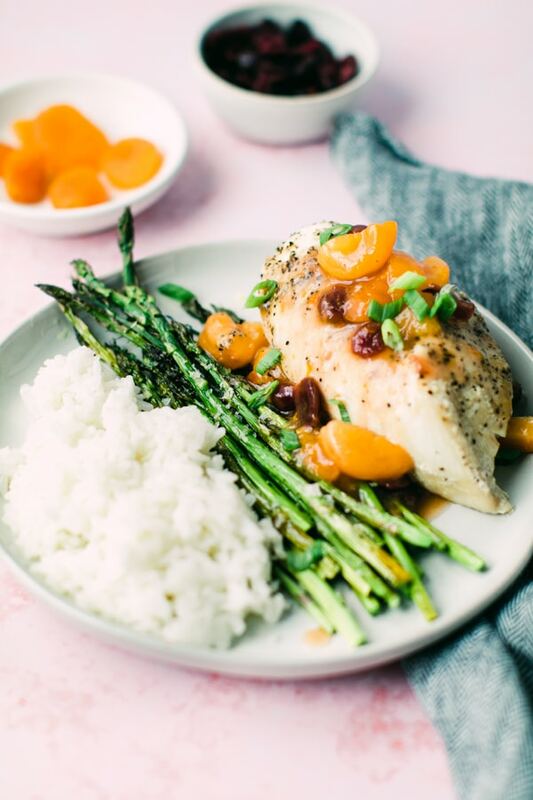 Dinner doesn’t get much easier than this Cranberry Apricot Chicken! The dried fruit cooks down with fresh orange juice, cranberry juice and white wine which gives the chicken a heavenly sweet glossy coat. Smother the fruit just on top of the chicken or on top of the veggies and rice too! This was an all time favorite of mine when I lived at my parents! My mom shared with me that this was a recipe my dad fell in love with one year when she made it for him on Valentines Day. I love it because it is such a satisfying dish yet light and nutritious – perfect for an easy weeknight dinner. For the first time ever, the Dietary Guidelines have advised Americans to consume less than 10 percent of total calories per day from added sugars to help reduce calories from foods that contribute minimally to overall nutrient intake. However, they recognize the value of cranberries – and have made an exception – for nutrient dense fruits and vegetables (like cranberries or rhubarb) that are naturally tart and sweetened to improve palatability. The guidelines say that the American diet has room for nutrient dense foods with added sugars, as long as calories from added sugars do not exceed 10 percent per day. As you know, cranberry products are usually sweetened because unlike other berries and most fruits, cranberries are naturally low in sugar and high in acidity. Given the low sugar content, once sweetened, the total sugar of dried cranberries is comparable to other dried fruits, like raisins and dried cherries. This dish is quick and easy, yet looks elegant so it will impress your guests or loved ones! In a large frying pan, combine broth, grated orange peel, orange juice, wine, apricots, dried cranberries, and cranberry juice. Add the chicken to this mixture, cover and bring to a boil. Reduce heat to simmer until the thickest part (the middle usually) of the chicken is no longer pink. (15-20 minutes). Transfer chicken to a platter and cover to keep warm. Bring the liquid in the pan back to a boil, uncovered so you can let it reduce down to about 1 cup. (About 3 minutes). Next stir in the cornstarch mixture and whisk until thickened. (Season to taste with salt and pepper if desired). Spoon some of the sauce over the chicken and pour remaining sauce into a bowl. Garnish with green onions and slivered orange peel if desired. 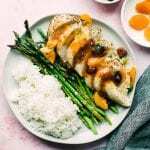 I like to serve this chicken with couscous or rice and a veggie - like asparagus or broccoli! THow do cranberries fit in a healthy eating pattern? To add ½ cup serving of fruit to a meal, add ¼ cup of cranberries to a favorite salad or whole-grain breakfast cereal, like oatmeal. Sip on ½ cup of cranberry juice cocktail to provide about 25% of the daily recommended amount of fruit for most Americans. Spread cranberry sauce as a fruity condiment for turkey and chicken sandwiches; as a topping for pork chops; or add to a slow cooker meatball recipe for a burst of flavor. Cranberries are a perfect berry for yogurt parfaits. Mix in whole-grain granola and dried cranberries for a satisfying snack, or stir in cranberry sauce for a custom cranberry yogurt. Howell AB, Reed J, Krueger C, Winterbottom R, Leahy M. A-type cranberry proanthocyanidins and uropathogenic bacterial anti-adhesion activity. Phytochemistry. 2005; 66 (18): 2281-2291. Howell AB. Cranberry proanthocyanidins and the maintenance of urinary tract health. Crit Rev Food Sci Nutr. 2002;42(3 Suppl):273-8. Sobota AE. Inhibition of bacterial adherence by cranberry juice: potential use for the treatment of urinary tract infection. J Urol. 1984;131(5):1013-6. Blumberg JB, Terri A. Camesano TA, Cassidy A, Kris-Etherton P, Howell A, Manach C, Ostertag LM, Sies H, Skulas-Ray A, Vita J. Cranberries and their bioactive constituents in human health. Adv Nutr. 2013;4:1–15. McKay DL, Blumberg JB. Cranberries (Vaccinium macrocarpon) and cardiovascular disease risk factors. Nutr Rev. 2007;65:490-502. Reed, J. (2015, October). Effects of cranberry proanthocyanidins on gram negative bacteria: Implications for gut health and chronic inflammatory disease. Presentation conducted at the Cranberry Health Research Conference, Madison, WI. 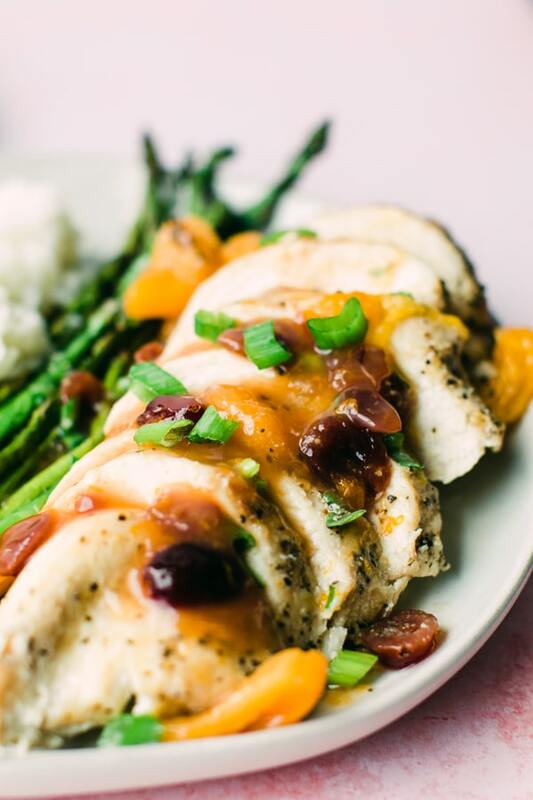 PIN this Cranberry Apricot Chicken for later! 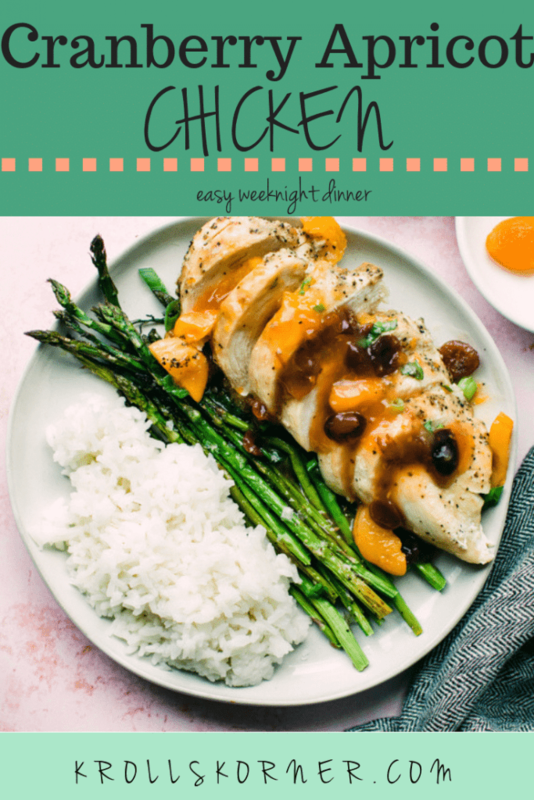 With that…I hope you enjoy this flavorful chicken recipe! What a pretty and delicious dish. And easy too! Love adding dried fruit to recipes – apricots, cranberries, and plums (aka prunes) are my faves! Thank you! Mmmmm yes me too, love when the sauce reduces ! Thank you! It’s an all time fav in my family 🙂 enjoy! Such a stunning flavor combo!! 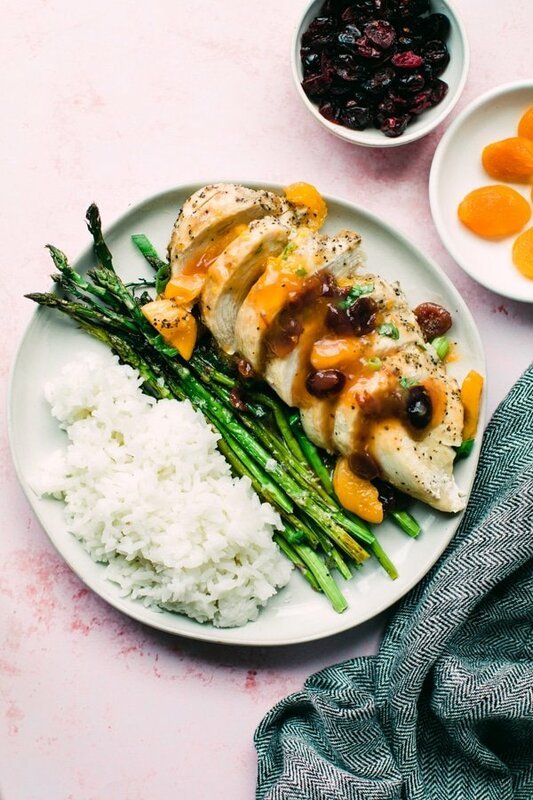 I love pairing fruits with chicken! I love adding sweet condiments to chicken! I usually add mango salsa so adding cranberry and apricots just seems appropriate!